You deserve a financial advisor who is a solid fit for your needs and personality. We are enthusiastic about helping women joyfully claim their financial power. 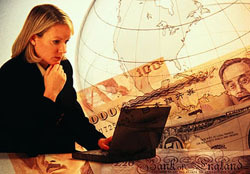 While personal finance is important for both genders, it is extra important for women. Statistically speaking women earn less, live longer, and spend more time out of the workforce caring for family. As a result, two-thirds of women over the age of 65 today rely on meager Social Security payments as their primary source of income. To change these gut-wrenching statistics, we must make the financial well-being of women a priority. If someone asked you to describe prosperity and security, what would you see in your mind's eye? When it comes to financial planning, it's easy to jump right into the minutiae of investments, skipping over the deeper questions of what you really want from your money, both now and in the future. We want to help you figure out exactly what you need and want. Only then can you make the smart money decisions that can help turn your vision into reality. You deserve to work with financial advisors who want you to feel more excited than ever about your money, and about all the good things it can bring.